I am newly registered here on this forum and I am very new to building furniture. I have done many smaller projects (boxes, frames, craft items) but nothing to the scale that I am currently attempting. I am building a work desk/table. I have glued up a section of 1 1/2” thick cherry which is 7’x3’. I have also cut some tapered legs with the large end being 3 1/2” x 3 1/2” as viewed from the top down on the leg. I have selected 3 1/2” x 3/4” cherry for the aprons which have a 1/2” set back of the aprons from the leg face and the upper edge of the aprons to be flush with the tops of the legs. The table top will have a 2 1/2” over-hang all around with a slight beveled edge. The table top and legs look great but now to the base. For the apron to leg joints I am going to use mortise and tenon. I have read about a variety of approaches to this including haunched joints but honestly, this may be a stretch for me. I would like to keep it as simple as possible. I was nearly committed to begin making the joints but then I came a cross some reading material which caused me to rethink. Initially I was going to maximize the surface area and keep the tenons as large as possible and simply keep them at 3/8” thick with 3/16” for the shoulders all around. After doing a couple test joints, I came to realize that this doesn’t keep a lot of “meat” at the top of the mortise in the legs and with a bit of racking or movement of the table, the top of the legs might fail. I made a variation whereby I made one joint with 7/8” upper shoulder to the leg but the tenon now looks a bit skimpy. Given my materials selection, and keep in mind my limited experience, could someone recommend a mortise and tenon layout? In advance let me say thank you for any advice you might have and certainly your patience with a newbie. I’m sure you’ll get lots of different opinions on this, but simply put — if your mortises and tenons are properly cut and fit well, and you glue them properly, they aren’t going anywhere for a long time. 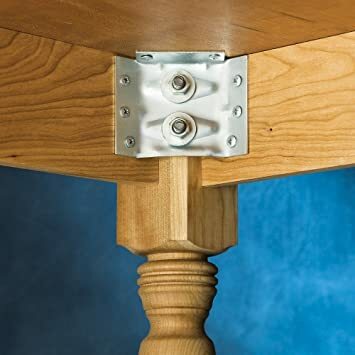 You can increase the stability of the table by using corner braces. A couple of examples below. Are you glueing the joint? If so the amount of wood at the end of the mortise does not matter. Just make sure it is not so tight that splits when you put a tenon in it. I am planning to glue this up. My biggest last minute concern before cutting was the amount of material I need between the top of the mortise and the top of the leg. The long lever of the apron worries me that if the table were ever leaned on in a racking motion that the top of the legs would tear out. Is there a safe top shoulder thickness I should be looking at? 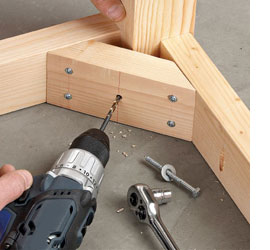 I am planning to use a corner brace much like the one in the photo by the way. Thanks so very much for your replies and advice. I would probably use 1/2” x 2.75” tenons. mind they aren’t much trouble. I thank you kindly Loren. Wonderful information. Good advice above on the MT joints. When you get to the point of attaching the top to the aprons, be sure to allow for expansion across the width. A 36” wide top will potentially move quite a bit depending on where you live. There are a number of ways to handle this including figure 8 fasteners and various clips and slots. Lots of info on the web about this. It’s been awhile since I’ve posted or followed up to this project. Because of some personal things, the project was delayed but it’s all back on track (mostly). I’ve finished the build of my aprons and legs…my first time ever with mortise and tenons and I have to say I’m very pleased. The top has been also assembled and everything has been finished using waterlox. I’m now at the point to attached the top to the base and today I realized something that has me very concerned. I didn’t notice this during assembly but, on the two long sides of the apron/legs assembly, the long side rails are down below the top edge of the legs by about an 1/8”. When the table top is place onto the base, there’s an approximate 1/8” between the bottom of the table top and the long side aprons. I’m sure this is a complete newbie move but what should I do? I’m considering cutting some small wooden spacer at the location where my table top fasteners are going to be installed but I’m really unsure about this now. I was planning to use z-fasteners by the way. Thank you for any advice you might have for me. Actually, allow me to revise this…the ends where the aprons meet the legs is really about a 1/32” of an inch down from the top of the legs…it would seem that the long aprons may have a bit of a bow to them such that in the middle of their span, there’s an 1/8” gap between the apron and underside of the table top. Don’t do anything about it. No one is going to crawl under there to look for a gap and if they do, accidentally kick them. If the top cupped, it might cup back. Thanks very much. If I use the z-fasteners…should I screw them down tight so that it pulls the top down? If I apply some downward pressure onto the top, I can get it to flex and make contact with the aprons, or, should I leave it unsprung?